I wasn't born loving food. It's something I have gotten more into as I have gotten older. When I talk to people about some of the restaurants I like, one of the first things they want to say is "I don't know if I would like that." Part of me wants to shake them and convince them to give it a try. The other part of me totally gets it. I grew up eating simple meals and not liking much of anything. My mom worked full-time so we had the easy stuff- hamburger helper, spaghetti, chicken nuggets, and canned and frozen veggies. And there is nothing wrong with that. It just didn't breed very adventurous eating habits in me. I hated seafood in any form besides canned tuna. I had only eaten your basic veggies and didn't really like them. And I ordered chicken something at pretty much any restaurant, all the time. I don't remember how or when it happened, but early in our dating days, Andrew and I got hooked on the Food Network (which I can't stand now, but that is another story for another day). He shared an interest in cooking with his mom when he was younger and really got into all of the different meals featured on the shows. Up until that point, he was pretty picky in his own way - sure, he loved seafood but his sisters joked that they never saw him touch a salad until he met me. One of our favorite restaurants to go to was Buca di Beppo (if there isn't one near you, it's an Italian chain with stuff on the wall that rivals TGI Friday's). On our first trip to Las Vegas together, we visited both Bobby Flay and Emeril Lagasse's restaurants and I think that started us on seeking out the best chefs, celebrity or otherwise. When planning trips out of town, the places we were going to eat became the most important thing to consider. 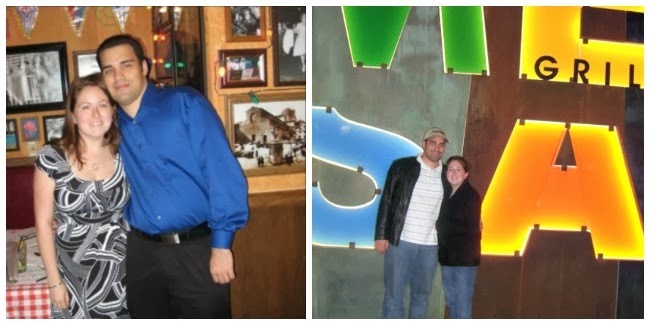 At Buca di Beppo in 2007 | Our third trip to Vegas together and our second visit to Mesa Grill (December 2008). The more good restaurants I went to, the more I wanted to try different foods. Chicken seemed like a wasted opportunity to try something amazing. I would lean toward the beef or pork instead. Or fish. Yes, during this time, Andrew started culinary school and began making fish at home so I gradually acquired a taste for it (though I still don't like shellfish). All of those new-to-me dishes were served with sides that I thought I hated. Mushrooms? Ew. Avocado? No thanks. I tried them again, made well, and fell in love with both! I have certain things I really don't like. I have to really trust a chef's reputation to go near broccoli. Andrew hates tomatoes. But for the most part, I like to attempt to trust a chef and that a meal will be good. Do I sometimes hate what I order? Yup. That's what husbands are for. We can usually swap plates. But, more often than not, going out of my comfort zone teaches me that I don't hate something as much as I thought I did. I didn't die after eating oysters or squid ink or raw fish, and while they may not be my first choices, I'm glad I can say that I tried them. 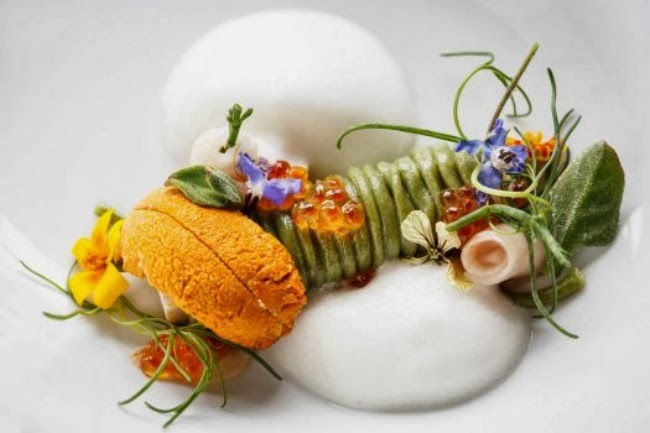 I ate the vegetarian version of this dish at The Pass almost a year ago and I am still thinking of it. The noodles are made with seaweed and the silkiest, yummiest piece of tofu was inside. Photo from The Houston Chronicle. All of my best dining experiences have included trying something new. It is hard to get past the "I don't like it" mentality but I assure you, your tastes have probably changed since you were 13 and decided you hated certain foods. Mine definitely have in many ways. You don't have to eat like Anthony Bourdain to have a good time at an offbeat restaurant. My best advice is to order a mixture between familiar and new. Go with the vegetarian option if the proteins are too weird. And, keep an open mind to enjoy the experience. If you go in with the mindset that you are going to hate everything, then you probably will. And I will never invite you to dinner. Unless we are just having chicken. That's always safe. But I will make sure to have plenty of sides on hand and encourage you to try something new. Oh and I am guest posting on my friend Bree's blog today to celebrate her wedding anniversary week. Go check it out! I hear you - I used to be quite the picky eater and while on some level I still am, I'm trying to be more adventurous. Especially with seafood - I didn't grow up with it, due to my dad claiming to be allergic, so for me it's hard to get used to but whenever I'm with someone who is eating seafood, I always ask to try a bite. Ditto with the eggplant I tried off a friend the other day. There are obviously some times where I find something is just not for me (I still can't stand papaya) but most of the time I'm pleasantly surprised. I'm growing up, apparently, lol! i try to taste things before i declare that i don't like it. except for brains and beef tongue which are my hubby's favorite - i just can't get over the thought of them to eat them. although i can't stand the sight of oysters, i tried one and it was ok (still don't know what the hype is about) but they're not something i would order if there are other things on the menu. I grew up so similar to you and it made me dislike a lot of foods. As I have gotten older I have branched out a bit more but I still don't like seafood. I do have a goal to try 6 new foods every year though. My Mom Mom never let me say I didn't like something before tasting it. I still will taste pretty much everything. I am less likely to try something way out of my comfort zone at a restaurant - if I'm out and paying, I want it to be something I know I'll probably like. I love all inclusives and cruises for that reason. I'll try it all, it's all already paid for. I grew up the same way! It was chicken, steak and hamburger helper all the time. At restaurants I was proud of my self for getting chives on my baked potato. ha! Finally in college I started to venture out and I discovered all the yummy stuff I never knew I liked! Now we try almost anything! I am finding that I now love foods I use to despise. Fish and zucchini especially, I couldn't do fish every night but I sure don't mind it once and a while. I get tired of eating the same boring things over and over so trying something new when given the chance is absolutely the best way to go. I was the same way growing up. My mom is a picky eater, too, so we enjoyed simple meals at dinnertime. As I started dating David, I got more comfortable with foods. I try new things more often now. My mom even comments, "Who are you?!" I've always liked broccoli, peas, and green beans, but now I enjoy other vegetables now, too -- like avocados (although... that may be considered a fruit...), onions, and I'm even starting to like tomatoes. I didn't do seafood before either. I can do tilapia and crab, but I still need to work my way up to the other ones. I used to be a ridiculously picky eater. I still don't do seafood but as a child it was a burger with no cheese and as an adult it's usually chicken everywhere. But, I have really branched out a lot!! I try new fruits and veggies I never would have before and I'm less likely to say I don't like it just because I've never tried it. I can definitely relate to this topic. There are still some "staples" like tomatoes and peppers that I hate but I've branched out a lot as I've gotten older. Good for y'all for trying new things! i had to learn to try, love, and appreciate good food too, because growing up my mom had a lot of food allergies so we have very boring meals. i just want everyone to be opened minded when it comes to food before they turn it away! Like you I grew into a fond loving of food, but the sad news is I married a toddler. He won't try anything new. Won't eat a pizza if it has anything other than pepperoni... I just have to go out with the girls to try new things! I swear with every post I read of yours, I feel like we are the same person. I grew up with simple food as well. My mom wasn't much for venturing out and only cooked what she liked. Basically chicken, hamburgers, Italian food and Kraft Mac and Cheese. I didn't try a taco until I was in 8th grade and my first Chinese experience was in college, sadly. Now I try lots of different things! I love sushi, Thai, Mexican, and sorts of veggies that she never made me eat because she didn't like them. I am still working on my taste for seat food. I enjoy sushi, and have found that I like amberjack served very fresh when I visit the gulf coast. I like crab dip and crab Rangoon. That is about it. Oh and shrimp queso is amazing. I totally grew up the same as you. I am really trying to branch out and try different foods. 80% of the time I am pleasantly surprised with what I try. The hard part is making the decision to try! I used to be really picky but my dad & stepmom became foodies after they got married, when I was in 7th grade, so after that they kinda forced me to try a lot of stuff I didn't want to. I am so glad they did. I am way more adventurous now & I love trying new things! I will never eat pickles or mustard though. EVER. Stopping by from Totally posted Tuesday! I'm with you, what happened to the FOod network? Did it used to be better? I love food and try everything and anything. I grew up the exact same way! Joey and I love sushi but my parents think it's the most disgusting thing ever. But have they ever tried it? Nope! They won't even try it so how do they know it's awful? They don't! We grew up eating pretty basic meals too - tacos, spaghetti, baked chicken, etc. Joey and I are definitely way more adventurous with our food, especially lately. There are SO many good restaurants in Houston to just pass up! Ok, I just can't get past that picture. I don't think I could eat it unless I had a blindfold on :) I totally want to hear about why you don't love Food Network anymore. Do you at least watch Top Chef on Bravo?? 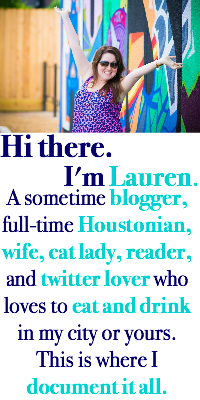 Also, living in Houston is absolutely what made me develop and aversion to restaurant chains. There are just too many locally owned places to try! It's like going on a new adventure every weekend.